The critical demonstration of treatment effect has often been challenged by clinical endpoint variability and technical confounds in biomarker related endpoints. ADMdx’s technology enables sensitive, powered measurement of treatment effect. 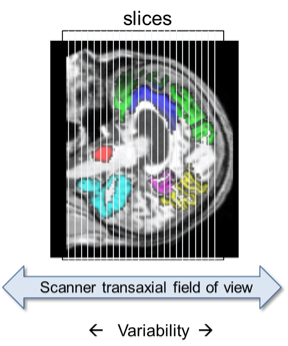 In PET imaging using amyloid, tau, or other tracers, ADMdx’ unique quality control procedures and measurement methods reduce variability and increase detection of subtle changes. - Identify the one or multiple brain networks affected using data driven voxel-based multivariate analyses. Pattern expression is translated into numeric scores that can be deployed in statistical analyses, along with metrics of the reproducibility and predictive power of the study results, and quantitation of each pattern’s contribution to overall effect. Above, ADMdx has developed methods that take into account within-scan variability to improve accuracy of amyloid and other measures. At left, ADMdx’ multivariate machine learning tools identify brain networks affected and their response to dose or other conditions, which are expressed as quantitative scores for statistical analyses.